As more oligonucleotide (oligo)-based drugs progress toward commercialization, reduction of production costs is a critical consideration. Some recent studies show that price and performance of the solid support can be major factors in reducing synthesis cost. For a given reactor column volume, increasing solid-support nucleoside loading, dimensional stability during synthesis, and synthesis efficiency can significantly enhance synthesis economy. Controlled porosity glass (CPG) is a popular support for oligonucleotide synthesis due to its unique combination of rigidity, well-defined pore structure, and dimensional stability in organic solvents. Commercial, low cross linked polystyrene (PS) supports can be loaded with initial nucleoside higher than conventional CPG supports and are often used for large-scale production of smaller oligos. Prime Synthesis’ HybCPG consists of conventional CPG particles that are coated with a thin, continuous and conformal polymer layer that is highly functionalized. This provides the advantages of a well-defined, mono-sized, dimensionally stable pore structure and rigidity of CPG with the higher loading capacity and chemical resistance to alkali solutions characteristic of polystyrene. This tutorial compares results for a number of different oligos synthesized by HybCPG, conventional CPG, and two commercial polystyrene supports. CPG’s loading capacity is limited by the density and distribution of surface silanol groups. Furthermore, surface area and number of anchoring silanol groups varies inversely with pore size. Thus, longer and/or bulkier oligos, which require minimum pore sizes of 1,000 Å or more, are made on CPGs with maximum nucleoside loadings below 50 µmoles/gram. 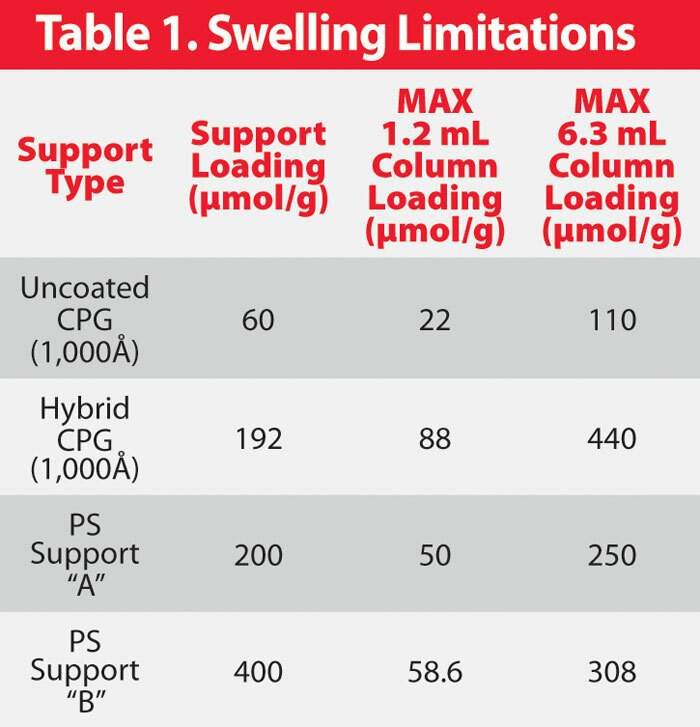 While low-level cross-linked PS supports can accommodate high ligand loadings on a dry weight basis, they expand when solvated, and column loadings must be limited to accommodate the swelling. Also, column backpressure can increase throughout the synthesis as the growing oligo causes further support expansion. Finally, column heights are limited due to the compressibility of the polymer supports. These drawbacks can limit the utility of such supports, and add further complexity to scale-up operations. 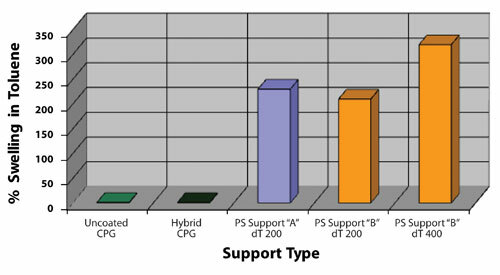 To address these deficiencies, a hybrid support based on CPG has been developed. Through a very thin, highly functionalized polymer layer based on polystyrene, much higher ligand loadings (<2–5x) than conventional CPG can be achieved, removing the pore size/loading trade-off of conventional CPG, since the number of unhindered ligands no longer depends on surface silanol distributions. Through careful design of the polymer structure, a uniform, sterically unhindered distribution of ligands is obtained. Since the polymer coating is very thin (~50 Å) and conformal, the well-defined, stable pore structure and low backpressure, typical of CPG, is retained (Figure 1). As with conventional CPG, and unlike polystyrene supports, the pore size and pore volume of HybCPG may be specifically tailored for each application to maximize the product purity. The thin polymer layer avoids expansion of the bulk support in synthesis solvents and protects the underlying glass from attack by alkali or fluoroacid reagents. The dimensional stability of the support also reduces the complexity of process scale-up as no accommodations are needed for swelling. Figure 1. Porosimetry scan for uncoated CPG and polymer-coated hybrid CPG. 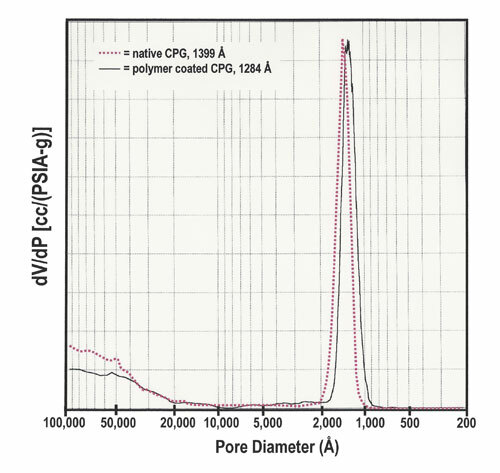 The pore size of the coated sample is reduced by 115 Å, inferring a multilayered polymer coating of ~60 Å. A single peak indicates that the uniform controlled pore size is preserved (i.e., no pore clogging or filling). Hundreds of oligos have been produced in-house on conventional and HybCPG with pore sizes ranging from 350 to 2000 Å, as well as low cross-linked polystyrene supports from two suppliers. The DNA oligo lengths range from 13 bases to 45 bases, with both PS and PO backbones. HybCPG supports typically had the initial nucleoside base attached, but several oligos have been produced on UnyLinker™ HybCPG with the recommended protocol modifications. AKTA Oligopilot 10 Plus and AKTA Oligopilot 100 synthesizers from GE Healthcare Life Sciences were used with 1.2 mL and 6.3 mL fixed column volume reactors, respectively. Figure 2. Effect of support swelling on column loading (synthesis scale). Both uncoated and hybrid CPG have 0% swelling in synthesis solvents, while polystyrene supports can swell up to 3.5 times in the same conditions. Columns may be fully packed with conventional and HybCPG supports in a dry state, without consideration of swelling effects, thus synthesis-scale calculations are simply a function of bulk density and nucleoside loading. The use of polystyrene supports in fixed column volume reactors requires knowledge and accommodation of the support’s “swelling volume” in typical synthesis solvents such as toluene and acetonitrile. Some of the higher swelling PS supports cannot be used with dichloromethane (DCM), a commonly used detritylation solvent. The effect of support swellability on synthesis scale is illustrated in Figure 2 and Table 1. 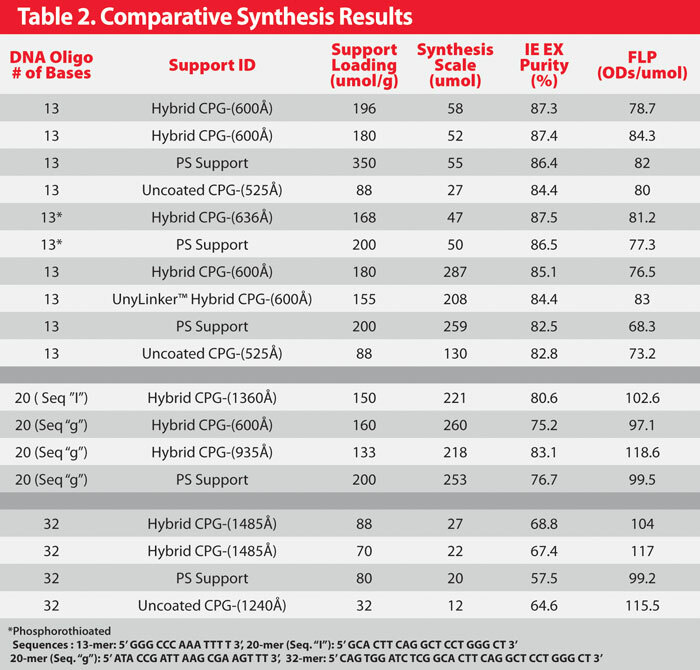 In Table 2, synthesis results are presented for a number of oligos synthesized on HybCPG as well as three other (control) supports (purity data courtesy of Integrated DNA Technologies). Recommended protocols for synthesis and post synthesis workup were used. One key element for successful oligosynthesis is clearly illustrated: the ability to optimize the pore size of the support to the specific challenges of the synthesis, an inherent advantage in both of the CPG-based supports. For the shortest oligos, pore sizes in the range of 500–600 Å work well. Similarly, the longest oligos require pore sizes of >1,200 Å. With oligos of intermediate length, or where sequence-specific coupling inefficiencies are more likely (e.g., 20 mer, Seq. “I”), larger pore sizes (~1,000 Å) are recommended. For the Seq. “g” 20 mer, synthesis results for both the PS support and 600 Å HybCPG are quite comparable. A unique property of HybCPG is that pore size increases can be made with little impact on nucleoside-loading capabilities. Thus, a slight increase in the pore size (HybCPG, 935 Å) has resulted in significantly higher FLP yields even at slightly lower synthesis scales, likely due to the greater coupling efficiencies afforded by increased accessibility to the growing oligo. With PS supports, this parameter is not variable, thus only nucleoside loading may be varied to optimize syntheses. Thus, the highly loaded PS supports used for 13 and 20 mers were not useful for 32 mers, where the loading had to be reduced by 2.5 times. With CPG supports, other physical properties, such as the bulk density and pore volume can also be varied to contribute to and maximize synthesis outcomes. This was demonstrated for relatively long RNA oligos by Ribozyme Pharmaceuticals, where a significant improvement in yields and purities resulted from increasing the pore volume at a given pore size. Oligosynthesis on HybCPG can also benefit from this kind of fine-tuning. A polymer-coated “hybrid CPG” solid support with superior mechanical properties, chemical resistance, and ligand loading has been successfully developed. As demonstrated earlier, a highly desirable application for the HybCPG will be to reduce the cost of producing short oligos at high column loadings. Although large pore size conventional CPG is presently the solid support of choice for longer oligos, HybCPG will permit significantly higher loadings at large pore sizes, thus reducing the costs for these oligos as well. Larger pore size HybCPG will also provide increased efficiency for the synthesis of oligos incorporating bulky modifications, such as lipids and other moieties for drug delivery. Finally, due to the conformal nature of the coating, this support can be used in synthesis applications where corrosive reagents (e.g., fluoroacids) previously prohibited any silica-based supports. Novel synthesizer designs are being considered to meet the demands for even higher volume and lower cost manufacturing of oligos in the future. HybCPG’s dimensional stability and wide range of physical characteristics will allow configurations for tall-form column geometries, higher pressure and flow rate operations, stirred batch reactors, fluidized bed reactors and dry-loaded fixed volume designs. Dianne M. Rothstein, Ph.D. (dmrothstein@primesynthesis.com), is the vp of research and Marc L. Rothstein is the president of Prime Synthesis.